Hate to use a cliche, but one of these things is indeed not like the others. Morbidly curious? 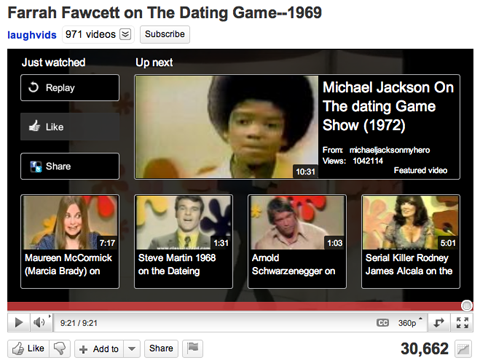 Watch the video to see convicted serial killer James Alcala win on the The Dating Game and prove that years of slasher movies have at least taught women that the guys who look, act, and speak like serial killers may in fact be serial killers. The only problem is that most of the contestants have the awkwardness of a serial killer. My eyes rolled so many times after listening to the forced innuendo in those questions and answers that they almost rolled out of my skull!